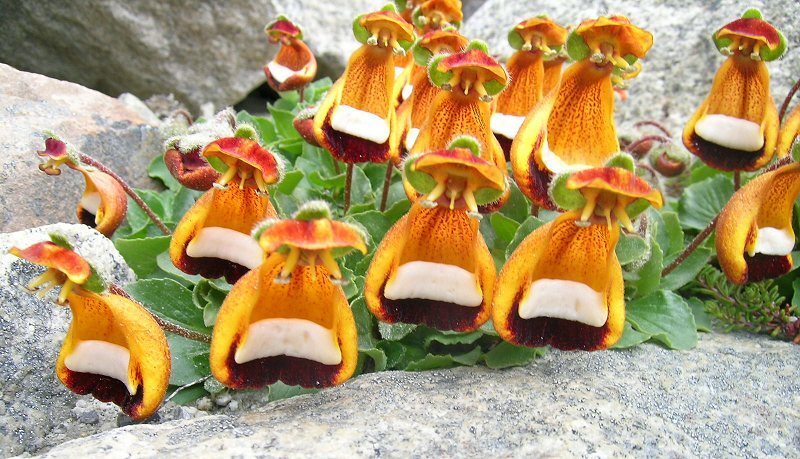 The website from which a got this image, Strange and Wonderful Things (a title after me own little heart), compares these funky little flowers to “little orange penguins marching over the rocks”—and yeah, I can see that. But I see a bunch of old aunties in wide hats toting their bins back from the fields, or maybe the market. Clouds are masses of frozen liquids suspended in the atmosphere, and one can use SCIENCE to determine how they form and what their shapes say about conditions in the atmosphere and that’s all for the good. Similarly, one can use the tools of SCIENCE to discover that c. uniflora is “distantly related to Foxglove and Generiads”, and that the flower is pollinated by birds who eat the white bits of the bloom. But sometimes clouds are castles or armies or profiles of Abe Lincoln, and sometimes flowers are little orange penguins or bin-toting old aunties in wide hats. So I had this post in my head about understanding and not understanding and agnosticism and religion and politics and empathic imagination. . . .
It’s still there, and there it remains, at least for another day.